Fireplaces are one of the best things about cold winter evenings. Though it has been a central point of innumerable houses, keeping people warm for ages, there is much more to it than meets the eye. This handy infographic illustrates such interesting facts:. Not all Fireplaces create smoke – The chimney of the fireplace is the engine of the system. As you start the fire, the warm air rises and warms the chimney creating the draft. This is why you want lots of paper & kindling to get the chimney warmed up quickly. High-efficiency stoves burn the smoke and gases in the firebox, so when you look at your chimney you will see heat vapour, not smoke! Chimney Fires are super-hot – Regular usage of the fireplace calls for routine maintenance and cleaning. When not cleaned regularly, it can result in creosote buildup in the chimney. This creosote is extremely risky as it highly flammable and can set the entire house on fire burning at extremely high temperatures and reach up to 2,000 degrees Fahrenheit. Thus, it is always important to have the fireplace and chimney cleaned regularly. Fireplace Inserts can do wonders – Traditional wood-burning fireplaces are often regarded as inefficient heat producers. However, a fireplace insert can do wonders in increasing the efficiency of the fireplace. Fireplace inserts burn wood with almost 80% efficiency. They produce flames that are hotter and longer-lasting, retaining heat for a long time. Thus, they enhance the efficiency of the fireplace significantly. LED lights for ambiance – Modern fireplaces are equipped with LED lighting that illuminate the firebox. This helps in the appearance of the flames, especially if you have the flames set at a lower level, giving the appearance of a dying fire with less heat. Zone Heating for reduced bills– Zone heating systems heat up the area the fireplace is located in. With the help of such a system, you can heat the rooms that are in use, and not the ones that are not. This will effectively heat up the rooms that you spend the most time in and save on the energy used in heating the others. This saved fuel will ultimately bring down your fuel consumption cost. Less Cleaning for gas fireplaces – Gas fireplaces offer an array of advantages over traditional wood fireplaces. Out of it all, the biggest benefit gas fireplaces provide is that they are easier to clean and maintain. Unlike wood-burning fireplaces, gas fireplaces do not produce any ash and soot. This means that there is no need to clean the ash out of the fireplace. This also eliminates the need for regular sweeping of chimney. 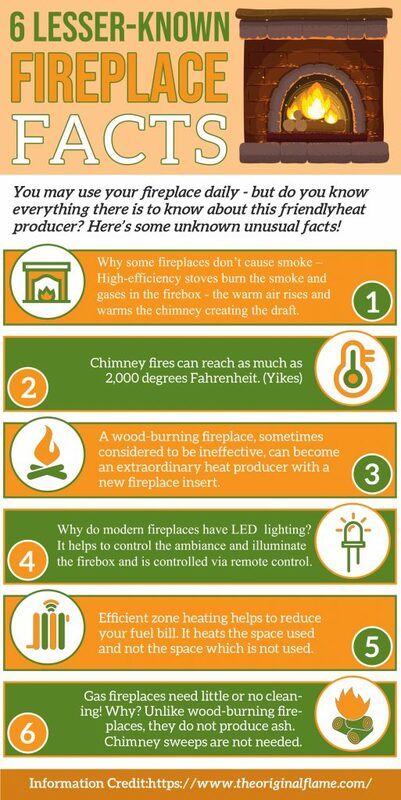 These are six lesser-known facts that can help you in increasing the efficiency and the safety of your fireplace.